Kyuma and his dog Inui live in the mountains, where Kyuma trains every day to become a great ninja. But when Kyuma mistakes a baseball coach for his training master, the local baseball team ends up with its first ninja player! Can a ninja step up to the plate and learn how to play ball? Kyuuma! 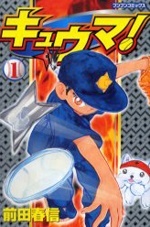 was published in English as Ninja Baseball Kyuma by Udon Entertainment from April 1, 2009 to September 15, 2010.